Sumitra and her team are waiting outside to get the Naagmani. Vish is shouting to help Mahir. Mahir gets down as a wooden table pulls down on him and he gets trapped there. Mahir is holding Bela’s bangle and shouting her name. Bela comes running to save Mahir but gets shattered down. Mahir is recalling his memories with Bela and fire comes down at him. Bela comes at the Haveli and is recalling her memories spend with Mahir. Bela recalls when she went inside the cottage and looks at the place completely burnt. Bela took a piece of Mahir’s outfit from there and is shocked to see the place. She holds that piece of cloth and recalls when Mahir was saying that he will leave her if she didn’t say I love you to him. Bela is crying badly and recalls her memories with Mahir. Vish and Vikrant get emotional after seeing Bela’s condition. Vish says that Bela doesn’t deserve this and God can’t do so much bad with Bela as she is a good person. Vikrant says that we will take revenge from Sumitra as she killed Mahir. Vish says that Sumitra is her mother and he can’t see her crying. Vikrant says that she is just a cruel woman in front of his eyes. Vikrant takes Vish with her to kill Sumitra. Vish rings the bell and Yuvi open the gate. Vikrant hits Yuvi and Vish comes in her Naagin avatar and kick Yuvi down. Vikrant moves ahead, leaving Yuvi with Vish. Vikrant shouts at Rohini not to interfere him and Rohini takes her steps back. Vikrant moves ahead, but Rohini comes back to hit him. Vish kicks Rohini down from the back. Vish bites Rohini and she gets unconscious. Vikrant moves upstairs and comes in Sumitra’s room. Vish puts Yuvi and Rohini in a room by covering them with a rope. Sumitra asks Vikrant that her assistant didn’t come here. Vish comes and says that she is her wife. Vikrant throws Sumitra and says that he will kill her today. A group of people in black outfit come in the haveli and drags Bela with them. Vikrant bites Sumitra and Vish says that they will kill her. Vish asks Vikrant to kill Sumitra or else she will do this. Sumitra asks Vikrant to help her. Vikrant says that he will kill her, but Sumitra says that help Bela. Vish takes Vikrant to help Bela. Sumitra says that everyone will get killed from the group which can’t be even defeated by the god itself. The black outfit men are dragging Bela with them. Vish and Vikrant come in the haveli and start searching for Bela. The group of men in black outfit takes Bela to a place and she is looking at them. Vikrant looks at the footprints and starts asking from the people outside. The people reveal that there was a group of people in a black outfit and have a sticker on the car named by Star travel agency. Vish and Vikrant leave to find her. Bela asks about the black outfit people’s identity. 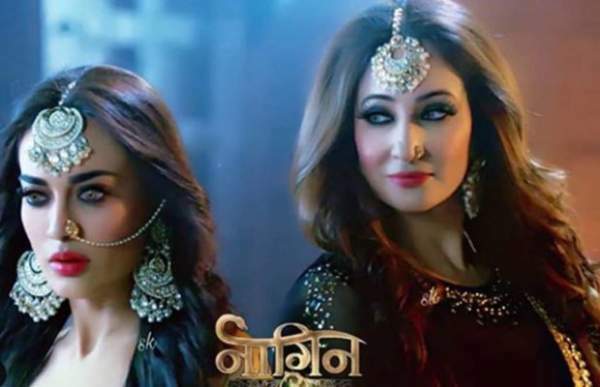 One member from the group asks Bela that she is the Naagrani or not. Bela can’t come in her Naagin avatar. The group member asks about the Naagmani or else she will get killed. She says that she has nothing to lose. A member slaps Bela and she says that she has lost her Mahir. She is quiet and the group picks her up and throws at a corner. The group says that they will get Bela fixed in the wall. Vish and Vikrant are asking about the car’s detail from the travel agency owner and moves towards Bela’s location. The group is putting the bricks in front of Bela and she is recalling her memories with Mahir. She is lost in Mahir’s memories. She shouts while recalling Mahir but the group has built a wall in front of Bela and gives her time to reveal about the Naagmani. She says that do whatever you want. The members put the last brick to cover Bela and throw kerosene oil at the place and burn it. Bela is stuck inside the wall and gets hurt. She recalls when Mahir said that she would live even after he dies as he will get hurt if she sees Bela getting weak in any situation. She recalls when she promises to live and fight with every situation so she thinks to escape from the place to stay alive. Someone looks at the place and call the fire helpers. Vish and Vikrant come to find Sumitra but can’t find anyone. The fire helpers have come at the location where there is a huge fire. One helper moves inside the building to see the environment inside the place. He throws a rope to get up to the burning place. Vish and Vikrant are praying to Lord Shiv for helping Bela. Vikrant says that it’s time for Lord Shiv to save Bela. Vish and Vikrant are dancing to show their devotion to Lord Shiv. Vish sits down in front of the god to seek blessings and a flower comes down in her hands. The fire helper comes in to take Bela from the place. He keeps her in a safe place and brings a doctor to check her. Bela comes into senses and removes the oxygen mask. She recalls when a man was saving her from the place. Precap: Mahir is back and Bela gets shocked to see him. Vish gets happy to see Bela. Vish and Vikrant are shocked to see Mahir. Mahir is fighting with a group of men! Next articleSuper Snow Moon 2019 (Date & Time): What, When is Next Supermoon and How To Watch Online?